If the pre-defined user roles don't match the work flow for your UDrupal Web site—as a site administrator—you can create additional roles. For example, if one person will be monitoring the interactive portions of your site (FAQs, Blogs, Comments, etc. ), you might want to define a new role for the person who is responsible for this task. We'll use this new role as an example. Log in to your UDrupsite as site administrator. 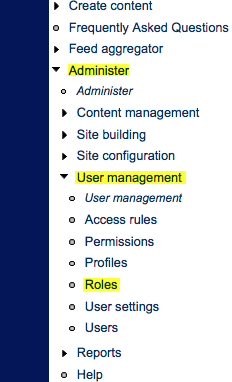 Navigate to the Roles page [Administer > User management > Roles]. In the dialog box, type a name for the new role. Click Add role. (In the following example, the name of the new role is MODERATOR). The new role will appear on the list of roles for your site. For the new role to take effect, you must click edit permissions. Scroll down the list of permissions and place a checkmark in the box(es) that correspond to the permissions you wish to give the new role. 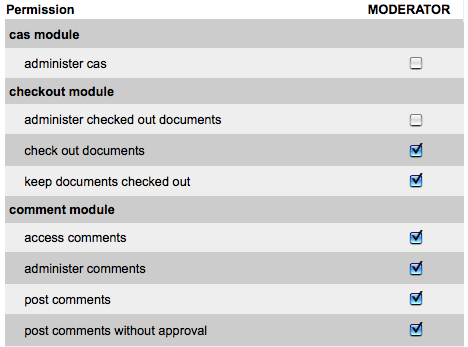 Each Drupal module has permissions you will need to set for the new role. After you set the permissions, click Save permissions (at the bottom of the page). If you want to change the name of the new role, click Roles from the Navigation menu. Type the new name of the role in the text box.